Explanation: The famous Martian meteorite pictured above houses microscopic structures interpreted by many as fossils of ancient Martian life. How do you find a meteorite from Mars here on Earth? On a typical day, several large rocks fall to Earth from space, usually winding up in the oceans. If they do not burn up in the Earth's atmosphere they are called meteorites. (Danger from falling meteorites is rare: the average person would have to repair meteorite damage to their home about every 100 million years.) Most meteorites falling on land are never located or identified - appearing similar to other rocks to the untrained eye. In certain places in Antarctica, however, meteorites stand out from the white frozen ice and snow beneath them, as if they were just left yesterday. 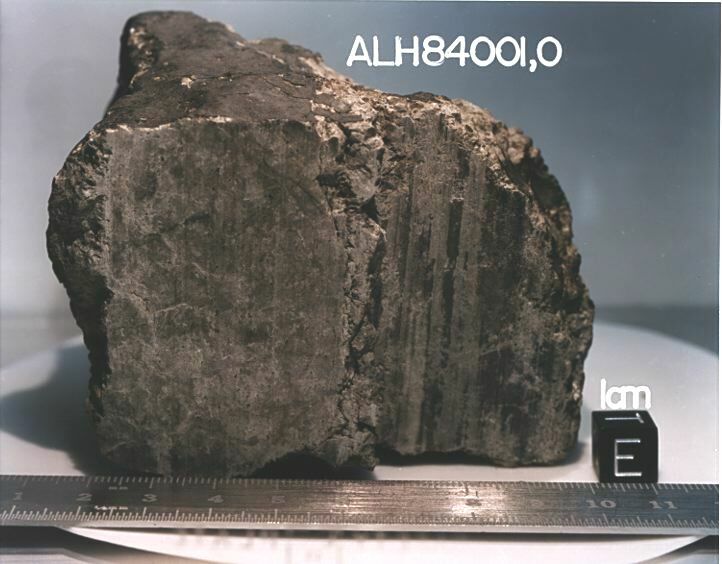 When the above meteorite was found in Antarctica, it was considered unusual because of its grey color. So far, about 12 Martian meteorites of similar mineral compostion have been found. One of these contains minute pockets of gases identical in isotopic composition to the Martian atmosphere as determined from the Viking measurements - implying the rocks indeed originated on Mars. These Martian meteorites are typically 1.3 billion years old or less, however, the one containing the potential microfossils appears to have an age of about 4.5 billion years.